Attractive offer available for bulk and retails buyers, Cash of delivery option available. To give softness from delicate skin. Rose is nourishing, rejuvenating and refreshing. Effective in conditions of acne, skin tanning. Contents: Oils of sesame, coconut. rose fragrance oil, rose petals powder, ceedarwood oil. Cold press method is used to retain the glycerin content in the soap. 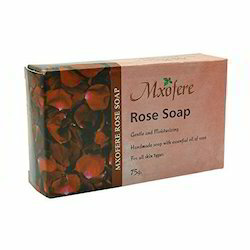 Owing to our expertise, we are involved in offering a varied series of Natural Handmade Rose Soap. Our offered products can be availed in an extensive series of forms, as per the requirements of our esteemed patrons. We introduce our business as a notable entity of a qualitative array of Pure Rose Soap. With the support of our dexterous professionals, we are offering highly effective Almond Rose Soap. 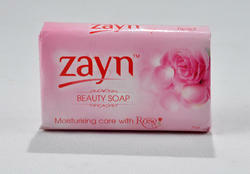 the soap is our most beautiful soap! The special fragrance from the country rose petals float in a fragrance blend of palmrosa and sweet orange. It is, one of the flowers, which is offering to divine by indian tradition. The aroma of country rose is believed to be an anti-depressant. Our soap is soothing to the skin and may help you through times of grief and sadness. Blended with all natural ingredients such as Lemon, Khus-Khus, Indian Madder, Coconut Oil, Almond Oil, Apricot and Persian Rose, this body soap deeply penetrates into the skin to hydrate it fully.